2 Is It All Great? This jug which features a little bit of an unusual approach towards water filtering comes from a brand which is fairly popular on the market when it comes to filtering water. 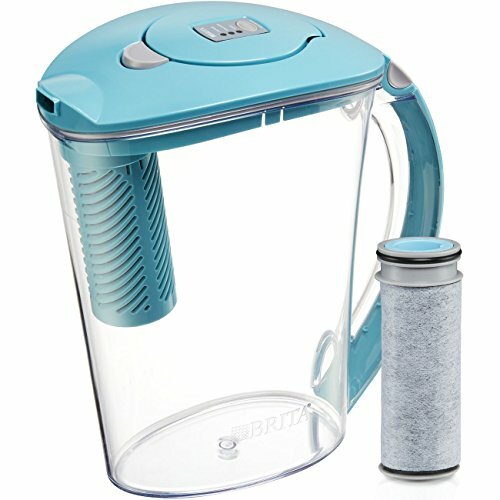 The Brita 10 Cup Stream Filter Water Pitcher is an impressive piece of craftsmanship and the main feature of it is the Filter-as-you-pour technology. This basically means that there is no secondary compartment or reservoir in the pitcher where filtered water is collected. No sir, you only have a filter at the mouth of the pitcher and as you pour the water into it, it gets filtered. 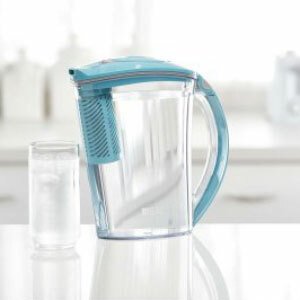 With the Brita 10 Cup Stream Filter Water Pitcher, you will be able to get fresh, clean water straight from the tap. It is excellent not only for drinking but also for cooking. As you pour the water, it gets filtered thus reducing any levels of chlorine and having the odor removed as well. Timesaving is obviously the name of the game with this product. There is zero waiting time when filtering water. Some people are concerned about the possible impairment of the stream because of the filter itself. It is believed that the filter actually blocks the water from being poured and slows it down. This is definitely not the case with the Brita 10 Cup Stream Filter Water Pitcher you still get a steady flow of water. There’s no trade-off as you are not getting instantly filtered water at the price of an inconsistent stream of water. You simply get both and you won’t even have to pay a fortune for the pitcher. The temperature of the water doesn’t matter. This filter pitcher can handle even ice. It is apparent that Brita gives us a product here with truly many uses. While it is hard to find any drawbacks here, it should be mentioned that special contaminants are not removed from the water. The Brita Stream Filter Pitcher will take care of the odor and chlorine in the water but that’s it. After all, there is a trade-off related to the instant filter. The quick filtering is not very thorough and definitely not in-depth. On the other hand, the filter will not leave any carbon particles (i.e bubbles) in the water as you pour it. Another fact that should be kept in mind is the relatively low price for such a convenient pitcher. It is due to the fact that the item is not made out of glass but is plastic instead. This is just one more compromise a buyer has to make if they want instantaneous filtration of water. Since we mentioned the price, you need to decide what is important to you. A typical water filter pitcher with a reservoir costs about 30% less. But this speedy filter pitcher will filter about 80% fewer contaminants. It all comes down to preference. The “not so good” part continues as we will also need to highlight a drawback of the electronic filter indicator. What it does is signal you when it is time to change the filter. So far so good, but this little gadget’s battery is not replaceable. Yes, they give it 5 years of life but this is highly doubtful if we talk about a regular use. Other than that, every given filter that you put in there should last for about 40 gallons. In other words that’s about 2 months. Come to think of it, such an efficiency rate is not bad at all because that’s almost 300 17 oz. bottles. When it comes to the dimensions of the Brita Stream Filter Pitcher the dimensions are nothing surprising as they are quite typical. The product weighs about 2 lb and has a capacity of 17 oz. Instant filtration – filters your water as you pour it. Decent filter life – use the pitcher a lot and often. The life of an average filter is about 40 gallons. Does not filter all contaminants from the water – if you are hoping to get rid of Mercury, Copper or Nickel, then you better have another thing coming.